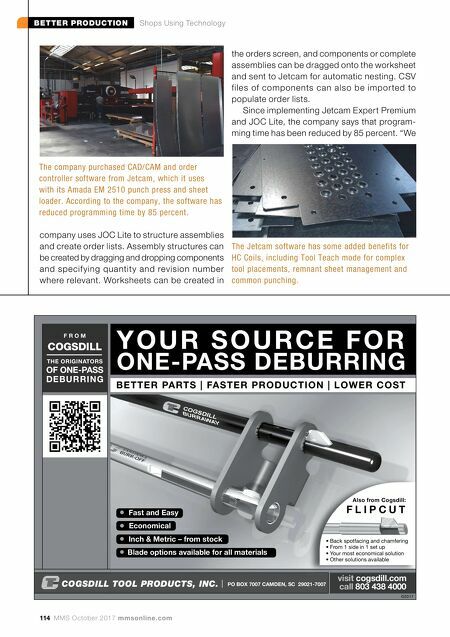 BETTER PRODUCTION Shops Using Technology 114 MMS October 2017 mmsonline.com Y O U R S O U R C E F O R ONE-PASS DEBURRING B E T T E R PA RT S | FA S T E R P R O D U C T I O N | L O W E R C O S T ©2017 F R O M COGSDILL THE ORIGINATORS OF ONE-PASS D E B U R R I N G F L I P C U T • Back spotfacing and chamfering • From 1 side in 1 set up • Your most economical solution • Other solutions available Also from Cogsdill: visit cogsdill.com call 803 438 4000 COGSDILL TOOL PRODUCTS, INC. PO BOX 7007 CAMDEN, SC 29021-7007 • Fast and Easy • Economical • Inch & Metric – from stock • Blade options available for all materials company uses JOC Lite to structure assemblies and create order lists. Assembly structures can be created by dragging and dropping components and specif ying quantit y and revision number where relevant. Worksheets can be created in the orders screen, and components or complete assemblies can be dragged onto the worksheet and sent to Jetcam for automatic nesting. CSV files of components can also be impor ted to populate order lists. Since implementing Jetcam Expert Premium and JOC Lite, the company says that program- ming time has been reduced by 85 percent. 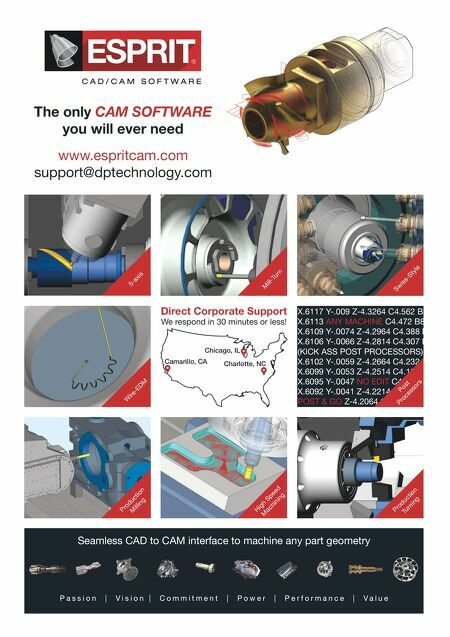 "We The company purchased CAD/CAM and order controller software from Jetcam, which it uses with its Amada EM 2510 punch press and sheet loader. According to the company, the software has reduced programming time by 85 percent. The Jetcam software has some added benefits for HC Coils, including Tool Teach mode for complex tool placements, remnant sheet management and common punching.